Type 201 is an austenitic chromium nickel manganese stainless steel that was developed originally to conserve nickel. It provides properties similar to Type 301 and can be used in most aplication for Type 301. This alloy is non magnetic in annealed condition, but becomes magnetic when cold worked. The rate of work hardening is similar to Type 301, although Type 201 develops somewhat higher yield strength while retaining equal ductility when cold worked. Toughness at low temperatures is excellent. 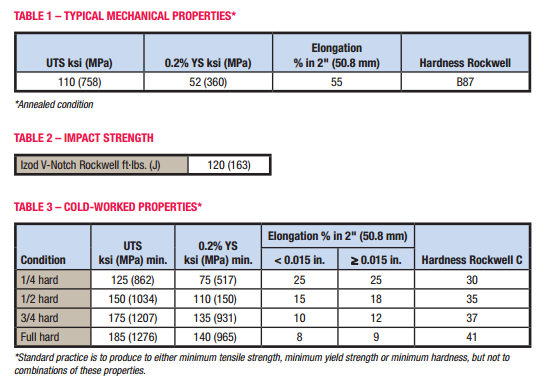 This table shows the Yield strenghth of 201 stainless steel with strength of SUS 201 is 360 MPA or 52 Ksi. And how about the SUS 304 and SUS 630, any ideas about it?